Inside The Market: Geox S.p.A. : the FY 2016 results undermine the ongoing turnaround. 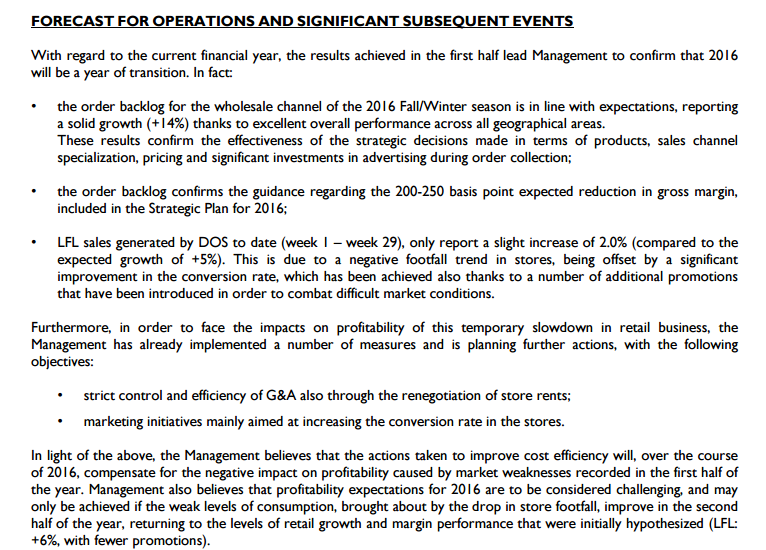 Geox S.p.A. : the FY 2016 results undermine the ongoing turnaround. 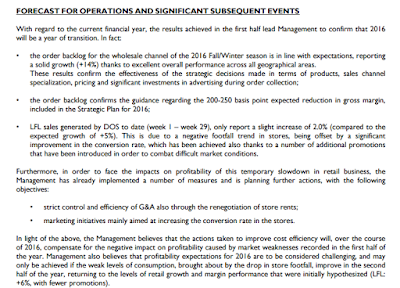 The FY 2016 results are under the expectations of the analysts' estimates and of the targets of the business plan. 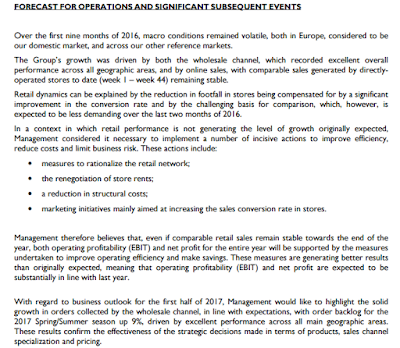 The revenues grow by 3% (vs the CAGR of the BP, about +6.5% or +5.5% with the lower range of the guidance). 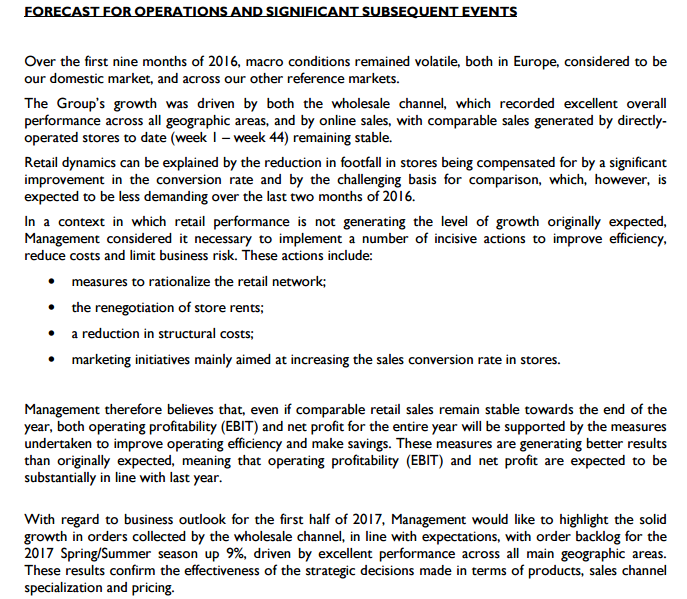 Of course, the margins are really under pressure : the gross profit decreases, the same both for the EBIT and for the net income. The results should be considered net of extraordinary items. However, the business is not proceeding well and the cost savings policy is not giving the desired results. We have an increase of four percentage points, with regard to the cost of sales margin (from 48% to 52%). Overall, there is a great margins erosion. About the expectations, they were estimated stable or slighty higher compared to the FY 2015 results. See the link to read about the related press release and compare it with the consensus. On many fronts, they are disappointing, more so after the good trend of the 9 months 2016 (appreciated by the market at the time of the release) and a fortiori with the good progress of the triennium 2013-2014-2015 (appreciated by the market with an excellent stock market performance from 2 to 4 eur/share). 5) The loss of the profitability in the first half of the year 2016 had to be compensated along the second half of the year but we have a clear decline of the margins. They should work well over the next two years of the plan, to regain credibility, also focusing on the new CEO and on the new markets, like China. The small margins are the great problem ; they must work in that direction (improvement of the margins). 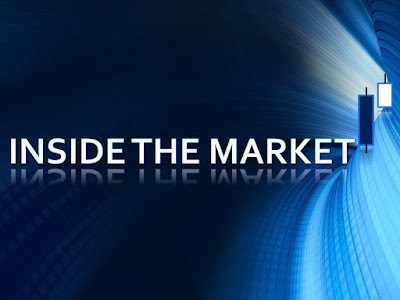 Otherwise, the market will probably dislike with a bad price performance ; the decrease of the stock is the evidence, after the earnings release (the negative impact was partially offset by the good performance of the FTSE-mib ; Geox, beta of about 0.80/0.90).